This was not how Democrats expected, much less hoped, to begin their new House majority. After the blue wave crested, ever so slowly, in November, the start of the 116th Congress on Thursday loomed as a moment of potential drama, a Constitutionally-mandated deadline for the party to decide whether to make a generational change in leadership. In the weeks after the election, Nancy Pelosi scrambled to put down an intra-party rebellion that threatened to turn her elevation to a second stint as speaker into a nail-biting vote and a showcase of Democratic division. She succeeded in impressive fashion, securing support vote-by-vote and demonstrating the formidable skills that have kept her atop the Democratic caucus for 16 years. Once that leadership challenge fizzled, a new, more triumphant vision for the opening of Congress emerged: Pelosi would become the first person in more than 60 years to reclaim the speaker’s gavel, and then Democrats would promptly set about passing bills to deliver on their campaign promises and place their first checks on President Trump’s power. Their initial volleys would include legislation to enact so-called “democracy reforms” to address campaign-finance loopholes, and measures to expand voting rights and limit gerrymandering. Bills to beef up protections for people with preexisting conditions in the Affordable Care Act and tackle high prescription drug prices would follow soon after. Yes, these proposals would be dead-on-arrival in the Republican-controlled Senate, but the goal was to send an immediate message to their constituents and reset a legislative debate that had swung far to the right for the past two years. Instead, neither of those scenarios will occur. Pelosi won the speakership in a floor vote early Thursday afternoon, having punctured a group of about two dozen Democratic opponents by cutting one-off deals with some members and agreeing to procedural reforms to secure the support of another bloc. She secured 220 votes, narrowly clearing the majority she needed after 15 House Democrats either stated the names of other candidates or voted present. Democrats inside the Capitol appeared to be jubilant as they gathered on the House floor with their families for the formal swearing-in and speaker vote. But they won’t be able to fully celebrate their first House majority in eight years, nor will they be able to swiftly act on their agenda. They’re taking over in the midst of a partial government shutdown—the first time in the 42-year history of the modern budget process that a transfer of power in Congress has taken place while major parts of the federal bureaucracy are shuttered due to a lapse in funding. Within hours of gaveling in the new Congress, House Democrats plan to pass two bills aimed at reopening the government, including one that’s identical to legislation the Senate unanimously approved in December to extend funding through February 8. The other measure includes bipartisan appropriations bills for six federal departments and a full-year extension of current funding for the Department of Homeland Security. Neither will include additional funding for Trump’s border wall, as he’s demanded. The bills represent an opening salvo both at Trump and at the Republicans who run the Senate, a bid to showcase Democrats’ new leverage while pressuring the GOP to end a shutdown the president had said he’d be proud to own. “We’re asking the president to open up government. We are giving him a Republican path to do that,” Pelosi told reporters on Wednesday outside the White House, after a meeting with Trump that leaders in both parties conceded had yielded little progress. Indeed, as the new Congress begins, there is no end in sight to the shutdown. Senate Majority Leader Mitch McConnell said he would ignore the bills House Democrats plan to pass—as well as any legislation that does not have the explicit support of the president. McConnell acknowledged after the White House meeting that parts of the government could remain closed for weeks longer. The stalemate won’t stop Democrats from moving on the rest of their agenda. Pelosi’s office announced an event for Friday to unveil the party’s democracy-reform legislation, with votes next week. In her first speech to the House on Thursday, Pelosi plans to call for action to address income inequality and the climate crisis, and to reinvest in public education and workforce development. “Working together, we will redeem the promise of the American dream for every family, advancing progress for every community,” she plans to say, according to excerpts of her prepared remarks provided by her office. But the shutdown could sap much of the spotlight from the Democrats’ policy agenda, muddling their opportunity to drive the national debate, at least on their own terms, during their first weeks in power. It’s a reminder that this Democratic House majority will be fundamentally different than the one Pelosi led a decade ago. This freshman class may be infused with the fresh energy of young, diverse progressives and a record number of women. But it will share power with a president who does not cede center stage easily. Orchestrating this shutdown may not help Trump broaden his appeal at the midpoint of his term. 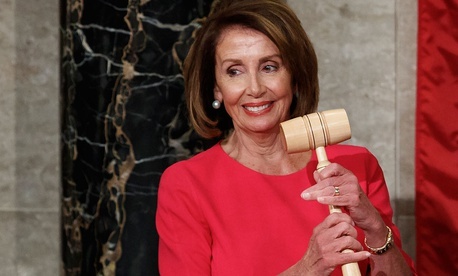 But if nothing else, it will deny Pelosi, and the new House majority she leads, their full moment of triumph. Next Post | Congress Used To Pass Bipartisan Legislation – Will It Ever Again?